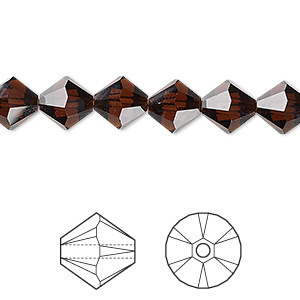 Bead, Swarovski® crystals, mocca, 8mm Xilion bicone (5328). Sold per pkg of 12. The full-bodied flavor of French roast is emulated in Swarovski's rich mocca crystals. Warm, translucent color looks stunning with Colorado topaz. Swarovski crystal components are made in Austria and are considered the finest products of their kind in the world.